A quick glance at Sony's compact, professional-grade NX70U camcorder reveals a wealth of features seemingly ideal for documentary (and backcountry) videography. To begin with there is the format: true HD progressive capture delivering full 1920x1080 resolution at a very forward-looking 60 frames per second. Want more choices? Not to worry: the NX70U also shoots 1080-60i and 1080-24p video. Documentary and run-n-gun shooters will love the NX70U's compact size and weight. Without the microphone holder/handle attached, the NX70U is a very reasonable one pound, thirteen ounces. Add the included mic rack and mono xlr microphone, and weight is a still-reasonable two pounds, thirteen ounces. Of particular note is the NX70U's zoom lens, which covers a broad 26.3 to 263mm (35mm equivalent) range. That 26.3mm on the wide end is simply outstanding—a true wide-angle option that opens up a vast range of creative choices/uses. Without the mic holder attached, the NX70U is small enough to look like a consumer camcorder. Sometimes you don't want your professional camera calling attention to itself, and for those situations, the NX70U is very discrete in appearance—nice. Small camcorders need good stabilization. The NX70U comes with Sony's highly-regarded Optical SteadyShot, including an Active Mode for extra effect. While perhaps not as good as the best of Sony's larger camcorders, the NX70U's OIS is still quite good indeed. I was particularly pleased with the way the NX70U's stabilizer copes with intentional movement, such as panning, without creating unwanted jumps or backtracking. I wish I could say I was dazzled by the NX70U's image quality, but the truth is I was not. In terms of sharpness would rate it as slightly better than Canon's 4:2:2 compact monster, the XF100, but be aware that you have to know how to get sharpness out of the NX70U, and corner sharpness will not be impressive regardless. In fact, let's just interrupt the review now to state that you should probably avoid this camera until at least March 2012. I have hopes that Sony will address and fix a number of critical issues that plague the NX70U. Until then, if you choose to get this camera, be prepared for some grief. To start with there is the matter of the NX70U's phantom ND filter. Active apparently only in full-auto modes, without it (as anytime you seize manual control of shutter or aperture) you will find yourself needing shutter speeds of 1/500 or higher to shoot ordinary scenes in daylight. Needless to say, that means you can kiss natural motion goodbye unless you add external ND filters. And even in full-auto, you still won't be able to shoot at 1/48 or 1/60 in bright sunlight. Given that the NX70U employs a 1/3" CMOS sensor, any attempt to shoot with smaller aperture settings to gain lower shutter speeds will dramatically impact image quality. The NX70U looks best wide open. Every stop closed comes with an associated and visible loss of sharpness (due to diffraction), with anything beyond f4.0 probably unacceptable due to softness and color fringing. So beware: if you're shooting in Active steady-shot mode in manual control, at f8 or higher, you'll likely be wondering why the NX70U's footage looks noticeably worse than your consumer-level handicam. There are other issues to worry about. My camera wouldn't record sound using the internal mic when temperatures dropped below freezing. There are reports of white balance and focus issues. As for controls and handling, the NX70U tilts closer to the consumer end of the spectrum. It favors auto shooters, burying many critical controls within touch-screen menus. There is a single multi-function ring on the lens, which is switchable to control focus, iris, shutter, or zoom. Repeatedly, you will find yourself searching in vain for features (timelapse?) or logical controls (an OIS button?). On the subject of zoom, the NX70's rocker control is simply hideous. Other reviewers hated it enough to send the camera back for the zoom control alone: it is utterly impossible to get smooth, slow, controlled zooms using the outrageously touchy zoom control. If fast, chaotic, gonzo-style zooms are your bag, no worries. Otherwise, wait for the inevitable firmware update to fix this inexplicable design failure. Bottom line: this is overall a huge bummer of a camera. It seems half-finished to me. The half that works is fabulous, and you'll love every bit of it. But beware show-stopping design and/or manufacturing bugs which will leave you pulling your hair out. 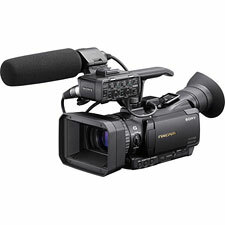 In many ways, The NX70U exemplifies the best of a modern, compact, documentary-style professional HD camcorder. But it's just not ready yet. Beware.